Definition at line 302 of file LegacyPassManagers.h. Definition at line 304 of file LegacyPassManagers.h. References llvm::ARM_AM::add, F(), and P.
Definition at line 1353 of file LegacyPassManager.cpp. Add pass P into the PassVector. Update AvailableAnalysis appropriately if ProcessAnalysis is true. Definition at line 1068 of file LegacyPassManager.cpp. References assert(), llvm::SmallVectorImpl< T >::clear(), llvm::PassInfo::createPass(), llvm::SmallVectorBase::empty(), llvm::Pass::getAsPMDataManager(), getDepth(), llvm_unreachable, llvm::SmallVectorTemplateBase< T, bool >::push_back(), llvm::SmallVectorTemplateBase< T >::push_back(), and llvm::Pass::setResolver(). Referenced by llvm::LoopPass::assignPassManager(), llvm::RegionPass::assignPassManager(), llvm::ModulePass::assignPassManager(), and llvm::FunctionPass::assignPassManager(). Add RequiredPass into list of lower level passes required by pass P.
RequiredPass is run on the fly by Pass Manager when P requests it through getAnalysis interface. RequiredPass is run on the fly by Pass Manager when P requests it through getAnalysis interface. This should be handled by specific pass manager. Definition at line 1326 of file LegacyPassManager.cpp. References llvm::dbgs(), llvm::Pass::getPassName(), and llvm_unreachable. Populate UsedPasses with analysis pass that are used or required by pass P and are available. Populate UP with analysis pass that are used or required by pass P and are available. Populate ReqPassNotAvailable with analysis pass that are required by pass P but are not available. Populate RP_NotAvail with analysis pass that are required by pass P but are not available. Definition at line 1143 of file LegacyPassManager.cpp. References llvm::AnalysisUsage::getRequiredSet(), llvm::AnalysisUsage::getRequiredTransitiveSet(), llvm::AnalysisUsage::getUsedSet(), llvm::SmallVectorTemplateBase< T, bool >::push_back(), and llvm::SmallVectorTemplateBase< T >::push_back(). Definition at line 1203 of file LegacyPassManager.cpp. 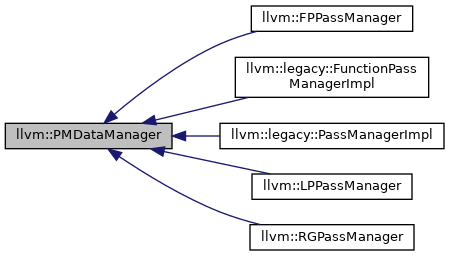 Referenced by llvm::RGPassManager::dumpPassStructure(), and llvm::LPPassManager::dumpPassStructure(). Definition at line 1219 of file LegacyPassManager.cpp. Definition at line 1231 of file LegacyPassManager.cpp. References llvm::dbgs(), llvm::EXECUTION_MSG, llvm::FREEING_MSG, getDepth(), llvm::Pass::getPassName(), llvm::MODIFICATION_MSG, now(), llvm::ON_BASICBLOCK_MSG, llvm::ON_CG_MSG, llvm::ON_FUNCTION_MSG, llvm::ON_LOOP_MSG, llvm::ON_MODULE_MSG, and llvm::ON_REGION_MSG. Referenced by llvm::RGPassManager::runOnFunction(), and llvm::LPPassManager::runOnFunction(). Definition at line 1284 of file LegacyPassManager.cpp. Definition at line 1275 of file LegacyPassManager.cpp. Definition at line 1293 of file LegacyPassManager.cpp. References assert(), llvm::dbgs(), llvm::SmallVectorBase::empty(), llvm::Pass::getAnalysisUsage(), getDepth(), llvm::PassInfo::getPassName(), llvm::AnalysisUsage::getUsedSet(), P, and llvm::SmallVectorBase::size(). Emit a remark signifying that the number of IR instructions in the module changed. F is optionally passed by passes which run on Functions, and thus always know whether or not a non-empty function is available. FunctionToInstrCount maps the name of a Function to a pair. The first member of the pair is the IR count of the Function before running P, and the second member is the IR count of the Function after running P.
Definition at line 165 of file LegacyPassManager.cpp. References llvm::Module::begin(), llvm::Function::begin(), llvm::LLVMContext::diagnose(), llvm::Module::end(), F(), llvm::find_if(), llvm::for_each(), llvm::Pass::getAsPMDataManager(), llvm::Function::getContext(), llvm::Pass::getPassName(), and llvm::StringRef::str(). Find the pass that implements Analysis AID. If desired pass is not found then return NULL. Definition at line 1187 of file LegacyPassManager.cpp. Definition at line 1037 of file LegacyPassManager.cpp. References llvm::FREEING_MSG, llvm::Pass::getPassID(), llvm::getPassTimer(), P, llvm::Pass::releaseMemory(), and X. Implemented in llvm::legacy::PassManagerImpl, llvm::FPPassManager, llvm::legacy::FunctionPassManagerImpl, llvm::LPPassManager, and llvm::RGPassManager. Definition at line 393 of file LegacyPassManagers.h. Definition at line 372 of file LegacyPassManagers.h. Referenced by llvm::PMStack::push(), and llvm::PMTopLevelManager::setLastUser(). Definition at line 384 of file LegacyPassManagers.h. Referenced by llvm::LPPassManager::cloneBasicBlockSimpleAnalysis(), llvm::LPPassManager::deleteSimpleAnalysisLoop(), llvm::LPPassManager::deleteSimpleAnalysisValue(), llvm::RGPassManager::dumpPassStructure(), llvm::LPPassManager::dumpPassStructure(), llvm::legacy::FunctionPassManagerImpl::releaseMemoryOnTheFly(), llvm::RGPassManager::runOnFunction(), and llvm::LPPassManager::runOnFunction(). Definition at line 1348 of file LegacyPassManager.cpp. Reimplemented in llvm::FPPassManager, llvm::LPPassManager, and llvm::RGPassManager. Definition at line 388 of file LegacyPassManagers.h. Referenced by llvm::LoopPass::assignPassManager(), llvm::CallGraphSCCPass::assignPassManager(), llvm::RegionPass::assignPassManager(), llvm::ModulePass::assignPassManager(), llvm::FunctionPass::assignPassManager(), llvm::BasicBlockPass::assignPassManager(), llvm::LoopPass::preparePassManager(), llvm::RegionPass::preparePassManager(), and llvm::PMStack::push(). Definition at line 369 of file LegacyPassManagers.h. All Required analyses should be available to the pass as it runs! Here we fill in the AnalysisImpls member of the pass so that it can successfully use the getAnalysis() method to retrieve the implementations it needs. Definition at line 1170 of file LegacyPassManager.cpp. References llvm::AnalysisResolver::addAnalysisImplsPair(), assert(), llvm::AnalysisUsage::getRequiredSet(), and llvm::Pass::getResolver(). Referenced by llvm::RGPassManager::runOnFunction(), llvm::LPPassManager::runOnFunction(), and llvm::PMTopLevelManager::schedulePass(). Definition at line 341 of file LegacyPassManagers.h. Set the initial size of the module if the user has specified that they want remarks for size. Returns 0 if the remark was not requested. Definition at line 143 of file LegacyPassManager.cpp. isPassDebuggingExecutionsOrMore - Return true if -debug-pass=Executions or higher is specified. Definition at line 139 of file LegacyPassManager.cpp. Definition at line 398 of file LegacyPassManagers.h. References llvm::PMStack::begin(), E, llvm::PMStack::end(), and I.
Referenced by llvm::LoopPass::assignPassManager(), llvm::RegionPass::assignPassManager(), llvm::FunctionPass::assignPassManager(), llvm::RGPassManager::runOnFunction(), and llvm::LPPassManager::runOnFunction(). Definition at line 935 of file LegacyPassManager.cpp. References llvm::AnalysisUsage::getPreservedSet(), llvm::AnalysisUsage::getPreservesAll(), and llvm::is_contained(). Referenced by llvm::LoopPass::preparePassManager(), and llvm::RegionPass::preparePassManager(). Augment AvailableAnalysis by adding analysis made available by pass P.
Augement AvailableAnalysis by adding analysis made available by pass P.
Definition at line 917 of file LegacyPassManager.cpp. References assert(), llvm::PassInfo::getInterfacesImplemented(), llvm::Pass::getPassID(), and P.
Remove dead passes used by P.
Remove analysis passes that are not used any longer. Definition at line 1016 of file LegacyPassManager.cpp. References llvm::dbgs(), llvm::SmallVectorBase::empty(), and llvm::Pass::getPassName(). Remove Analysis that is not preserved by the pass. Remove Analysis not preserved by Pass P.
Definition at line 969 of file LegacyPassManager.cpp. References llvm::sys::path::begin(), llvm::dbgs(), E, llvm::sys::path::end(), llvm::Pass::getPassName(), llvm::AnalysisUsage::getPreservedSet(), llvm::AnalysisUsage::getPreservesAll(), I, Info, llvm::is_contained(), and llvm::PMT_Last. Definition at line 373 of file LegacyPassManagers.h. Definition at line 370 of file LegacyPassManagers.h. Referenced by llvm::FPPassManager::doFinalization(), llvm::legacy::FunctionPassManager::FunctionPassManager(), llvm::PMTopLevelManager::PMTopLevelManager(), and llvm::PMStack::push(). verifyPreservedAnalysis – Verify analysis presreved by pass P.
verifyPreservedAnalysis – Verify analysis preserved by pass P.
Definition at line 951 of file LegacyPassManager.cpp. Definition at line 436 of file LegacyPassManagers.h. Definition at line 431 of file LegacyPassManagers.h. Definition at line 428 of file LegacyPassManagers.h. Referenced by llvm::LoopPass::assignPassManager(), llvm::RegionPass::assignPassManager(), llvm::RGPassManager::runOnFunction(), and llvm::LPPassManager::runOnFunction().